Lined with luxury boutiques, upscale ­eateries and bars bursting with well-dressed locals, George Street is one of the best places for people-watching in Edinburgh. Unfortunately, as I learned one sunny day, it is also the worst place in the city to have an embarrassing wardrobe malfunction. Instead of taking a relaxing stroll, pausing to peer in shop windows and admire the view, I found myself stopping every few seconds to readjust my tights, which would sag and droop as soon as I had finished hoicking them back up. Step, step, adjust. Step, step, pull. Step, step, yank. My walk had turned into a wiggle as I tried – and failed – to keep the waistband from slipping down my back, pooling at the bottom of my bum, and gathering into an uncomfortable bundle. Frustrated beyond belief, eventually I halted dead in my tracks, reached down and whipped the tights off in the middle of the street. It was mortifying. Later, I was chatting with friends and told them about my experience. To my surprise, every single woman I spoke to had gone through the same sartorial mishap. No matter their size or height, every one of them had faced the struggle of ill-fitting hosiery. In that moment a light came on in my head – there had to be a better solution. 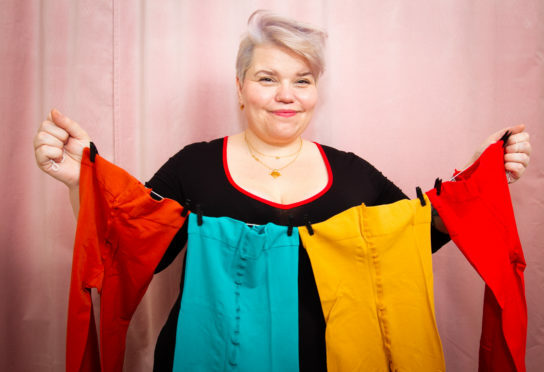 I hotfooted it to the shops, snapped up every single pair of tights I could get my hands on, examining the measurements and the fabric, and started putting together a list of what did and didn’t work. I quickly realised that all the pairs on the market were made the same way, whether you were an XXXL or an XXXS, and that just seemed crazy to me. So, that’s when Snag was born. My mission was simple: manufacture and sell tights that can and do fit every body. It seems like an obvious idea, but we are the only brand on the market to produce tights for every size and shape – and that’s what has helped to spur on our success. In the first 12 months of trading, we have sold more than 300,000 pairs of tights to people around the world, attracted 100,000 customers, and hit £2.3 million in turnover. Let’s face it, until now, men were the ones who had been designing, making and selling tights, and brands just weren’t considering how poorly-fitting clothing really can affect every moment of your day. If your tights are falling down, you’re uncomfortable and you’re not operating on 100%. Any woman will tell you that. I hate the thought of anyone feeling bad because of their body, their gender, height or disability. That’s why our marketing campaigns and website imagery is completely inclusive. And it’s also why we work a little differently, too. When I first started my career, I worked as a data analyst in a very male-dominated world and, from there, I transitioned into marketing roles. Although I’ve had lots of different jobs, they all involved the drudgery of the daily commute and sitting at a desk all day. So, when I set up Snag, I decided we should be a completely virtual business with no office space. Everyone works from home or wherever they are in the world – from Barcelona to Bali – and we don’t operate a set-hour policy. Staff work as much or as little as they want during the day, and they can take as much holiday leave as they need. We’re trying to give people flexibility in their lives. If people care about what they’re doing and care about their jobs, they aren’t trying to con you out of working. They’re doing the opposite. Plus, it means I can work from my bed a lot! In just a year, we’ve done more than I thought we could do – and more than anyone else thought, too. I applied for a funding competition about two years ago, and recently looked at the feedback. We weren’t brought forward in the competition because the judges thought the forecast we gave was unrealistic at £385,000 revenue in the first year. Now, we’re in the millions. It’s all down to our customers, the fact that we preach body positivity, and have a product that actually works to helps people. For me, a big part of being successful is knowing you’re helping to make people’s lives better. It’s all well and good making money and creating jobs, but if we can improve even just a tiny part of our customers’ lives, that’s an amazing achievement. Wilma Norris, a Business Gateway start-up adviser, shares her five top tips. 1. There are many options available when starting a business, including working from home full or part-time, buying an existing business or investing in a franchise. If you need extra support, Business Gateway offers free events and online resources covering planning, marketing, networking and taxes. 2. Money is necessary for any start-up, and you will need to cover your personal expenses until the business can support you. Different funding options include personal savings, bank loans or grants, and equity funding from private investors. 3. Even start-ups need to consider tax and legal issues. You should choose the correct legal structure (sole trader, limited company, partnership) and register with HM Revenue & Customs or Companies House depending on your decision. It’s vital to keep accurate records and pay tax and National Insurance. 4. Create a business plan before you start. There is a free template available to download from our website. Think of the headings in the plan as a checklist of questions to ask yourself to ensure your venture will work. 5. Have a clear understanding of your target customer so you can develop a plan to reach them. Once you have new customers, a focus on service will help you retain them.